Bull and Mouth Street ran between King Edward Street and St Martin’s Le Grand. The Old Bull & Mouth Inn, St. Martin’s-Le-Grand, engraved by W. Watkins, after Thomas Hosmer Shepherd. The street was first recorded on John Ogilby’s ’Large Scale Map of the City As Rebuilt’ (1676) and may date from rebuilding after the Great Fire of London. The Bull and Mouth Inn stood on the south side of the street. 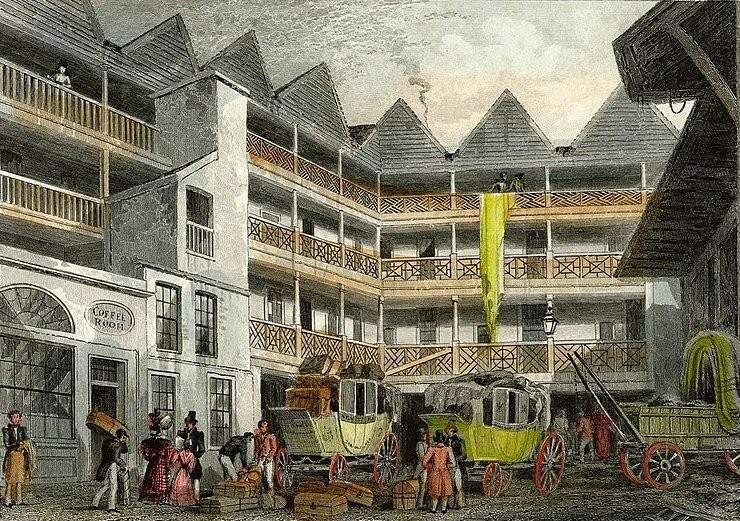 The inn was destroyed in the Great Fire and rebuilt. The inn’s original name was the Boulogne Mouth which referenced to the siege of Boulogne in the time of Henry VIII in 1544-46. The name became corrupted into Bull and Mouth. It was renamed as The Queen’s Hotel after being rebuilt as a hotel by the coaching entrepreneur Edward Sherman at a cost of £60,000. The hotel provided accommodation for passengers and underground stabling for 700 horses. An 1875 Ordnance Survey map shows the 1842 French Protestant Chapel at the eastern corner with St Martin’s Le Grand. The street was demolished in 1887 or 1888 to make way for new Post Office buildings.